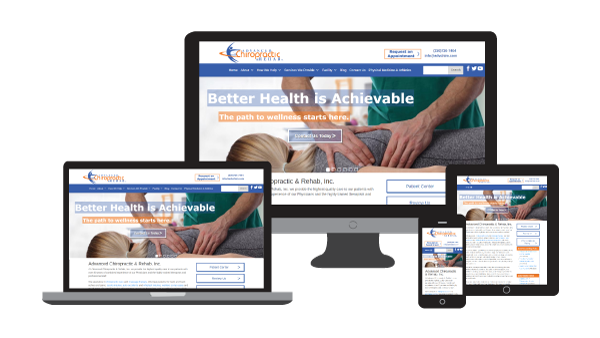 Although chiropractors and physical therapists differ in medical approach, their marketing and web design strategies are virtually identical. When done properly, a website will generate more leads than any other marketing effort. Print advertising has a shelf life before readers throw the ads away. Billboards, radio and television ads require appropriate timing. They are only effective when someone in need of care sees them while they need the care. Websites conversely have no shelf life, are searchable and always available. It is not enough to just have a website. Success is determined by having the right website that can be easily found by patients searching for care. Successful physical therapy and chiropractic websites must generate opportunities and then convert the opportunities to patients. To attract and convert, here is a list of characteristics that physical therapy and chiropractic websites should have. 1. A responsive website design, meaning a website that is optimized for tablets and phones. Over half of all web searches are now conducted on phones and tablets. In fact, according to Pew Internet, 55% of Americans said they’d used a mobile device to access the internet in 2012 and 31% of these mobile internet users said that their phone was the primary way they access the web. There is an old saying that you need to strike while the iron is hot. Think about your clients and when they need your services. A child is injured at a game. Are the parents going to wait to get home to find treatment or are they going to be researching options on their phone at the game? A patient sees their PCP and is told that they need to see a chiropractor or physical therapist to relieve their pain. Are they going to wait until they get home to get on the computer or are they going to use their phone to set an appointment and start the healing process as soon as possible? A worker lifts something awkwardly and hurts their back. Are they going to wait to find a chiropractor or physical therapist that night or are they going to use their phone to set an appointment for treatment on their way home from work? We are an impatient society, especially when it comes to health care. That is why it is absolutely crucial for medical professionals to have responsive websites. 2. A custom website template as opposed to a canned website template. When asked what differentiated their practice versus other competing practices, most chiropractors and physical therapists listed their service, staff and expertise. If those three characteristics are the biggest differentiation, why do so many practices rely on a canned website template that generically talks about the industry and does very little to promote the unique attributes of a specific practice? 3. A home page that reflects the specialties and expertise of the practice. If your practice has carved a niche with athletes, promote that. If your practice has geriatric care as a top focus, then speak to that. If you are associated with a health network or accept insurance that many others do not, make sure that is mentioned prominently. You have a matter of seconds to impress a web visitor. Make sure to seize the opportunity by having a professional home page that is easy to follow and conveys the uniqueness of your practice. 4. Prominent calls to action. There should be at least one call to action and contact information on every page. When possible, we strongly recommend having maps and office hours on every page as well. Other tips include having a phone number that is dial-able. This way a phone user can click on the phone number to dial your practice. Another recommendation is to make sure the contact form is easy to use and sends the patient a confirmation that the form submission was complete. 5. Great content. It is important to have specific pages for each condition and symptom treated as well as each service provided. This creates an improved user experience for your patients by not making them scroll through paragraphs about every type of condition the practice treats before finding the one they are looking for. Having the individual pages also improves the SEO of the website and provides a great tie-in for any pay per click advertising the practice might do. 6. Commonly-understood language and terminology. Physical therapists and chiropractors are very proud of their professions and they like to educate their patients. While this is a great trait to have, it can have adverse effects on website content if the language is too difficult for the potential patients to understand. Experts recommend writing web content to an eighth grade level. This can be difficult for medical professionals when they are explaining symptoms, conditions and treatments. Also, from a search engine optimization standpoint, patients are much more likely to search for “low back pain” than they would for “spinal stenosis”. Therefore, the webpage content should include more references to low back pain in order to perform better in Google search results. 7. Focus on the user experience with easy to find information. Having great content is only a benefit if people can find it. Make sure to organize information on the website and have an easy to understand menu bar. You want to direct patients to certain pages, not make them have to look everywhere. It is also a really good idea to have sub-menus on pages and internal links within the content. Also, always have a site map and a custom 404 page (page not found error) that can helps patients find the information they are looking for. 8. Links to blogs and social media. Blogs and social media accounts are the greatest means for physical therapists and chiropractors to build an audience. Blogging has many benefits including building credibility with your audience by showing that you are an expert, adding website content, expanding SEO and keeping your online presence fresh. Social media is a great tool for providing quick updates about the practice such as events and news. It can also be used to promote blog posts and provide timely information about the seasonality of injuries (i.e. snow shoveling in the winter, running in the summer…). 9. Testimonials and reviews. How important are online reviews and testimonials? Consider that it is a multi-billion dollar business with many companies such as Yelp, Trip Advisor and Angie’s List, just to name three, originally built based on just reviews. Customers tune out when someone talks about themselves. However, they pay attention to third party reviews. Often times, a website with testimonials and reviews will have a much higher conversion rate than a website without them. To add to this, if you treat a celebrity, make sure to promote this. Consumers have a tendency to think, “if that practice is good enough to treat (celebrity), they are definitely good enough to treat me”. 10. Search Engine Optimization. Having a website without investing in SEO is like having a building without investing in a sign. If you have a great website, is it really great if people cannot find it? SEO is an investment that can pay huge dividends. It is highly recommended to partner with a company that can address items such as meta tags, header tags, search engine submissions, indexes and analytics. When done correctly, physical therapists and chiropractors can receive a majority of their new patients from their websites. The great thing about a website is that is always up, always working and very inexpensive to maintain compared to the benefits they can produce. MIBS has experience designing, developing and delivering great chiropractor and physical therapist websites. When the time comes to build your new website or improve your existing site, please make sure to keep the professionals at MIBS TOP in mind.